Just northeast of Mallorca and the party isle of Ibiza, is an exotic island that offers the best mix of ancient culture, casual beach life and subtle luxury. Menorca, the least known of the Balearic Islands and not yet over run with DJ junkies or masses of budget tours, is an idyllic escape which more than lives up to the spectacular images of turquoise coves and pristine beaches. With plenty to see and do in Menorca you can easily spend a week or two for a well deserved break under the sun. Since its quite small you can get from Mahon in the east to Cuitadella in the west in about an hour. In the morning you can be on a beach on the south side and in 20 minutes you can be on a completely different type of beach on the north side. Since its small, no matter where you stay you will not feel like you are missing out on anything the island has to offer. Here are my suggestions for making your visit to Menorca a little more luxurious. 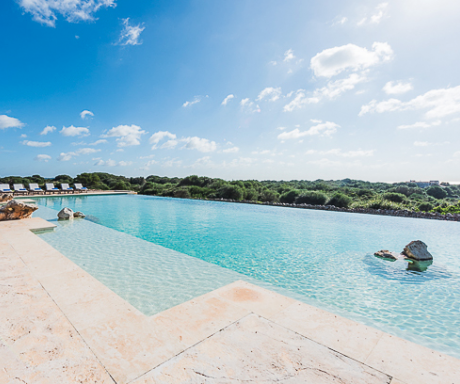 Only in the past few years has Menorca been able to offer truly exceptional hotels. On the top of my list is Torralbenc. Beautiful views of sea a top its own vineyard this is the best place to relax and treat yourself right. The staff is professional and beyond helpful. Boutique Hotel Jardi de ses Bruixes is a relatively new boutique hotel right in Mahon. Perfect for a couple nights to explore the city without having to get in the car. On the other end of the island in Ciutadella we find the new Can Faustino, In a landmark building with modern interiors that fit perfectly with the surroundings. But to truly settle into the landscape and enjoy the tranquil island life of Menorca like a local, consider staying in a private villa. One of the best on the island sits on a hill top next to the ancient Talayotic site of Torre d’en Galmés. It’s an old country home that has been renovated to the highest standards. With 10 bedrooms, a sprawling infinity pool, an equestrian center, a chapel (just in case) an entertainment cottage with cinema, billiards, karaoke and ping pong table it has everything you could want for downtime at home. The organic garden off the kitchen provides for the finest home made meals. Menorca has some of the best beaches in the mediterranean. One of the most striking characteristics about the beaches are the elevations and views they offer. It is possible to hike around the entire island going from cala to cala. On the top of the list of my favorite beaches to visit in Menorca we have Cala Macarelleta. You will need to do a little bit of walking but the path to get there is breathtaking. Be sure to step out to any of the look-out points for unrivaled views of the cliffs and sea. If hiking is not your thing, the only way to visit the most beautiful beaches on Menorca is by boat or yacht. Even for the most die hard beach fans, many of the coves are a long hike to get to and in the heat it makes the journey a little less sweet. There are plenty of options for hiring your own boat by the hour or day. Catering for lunch can be arranged with some local Pomade to drink and you are free to hop from one Cala to the next until you find the one that is just right for you. I recommend leaving from Cala Galdana on the south side of the island. I just could not do my Menorcan luxury list without including two products with names like Binifadet & Xoriguer. I had never heard of either of these until my first trip to Menorca. A local had asked me if I had tried the Rosè wine Binifadet or the Gin called Xoriguer, I said no to both, two beverages I seldom drink on the mainland. After the shock and horror left his face he promptly ordered a bottle of rose wine from the Binifadet vineyard right on the island to accompany our “Caldereta” (local rice seafood stew). I have to say it was perfect with our lunch. That evening I had to try the gin since it has been made on the island for the since 1784. The gin is mixed with a lemond made from fresh lemons and some simple syrup. In the heat with the setting sun it went down like water. Binifadet has a beautiful winery that anyone can visit. The grounds are beautiful and the wine seems to taste better at the source somehow. Go for a tasting and even stay for lunch or dinner at their restaurant. Xoriguer is also a good visit although not so high on the luxury scale. When I travel I always like finding that one spot that feels like no one else knows about weather it is a secluded beach cove or special sea view on a mountain side. Menorca is the kind of place that requires considerable local knowledge for navigating the winding country trails and stoned walled roads. If you like a bit of adventure try a guided 4×4 island jeep safari. The island is dotted with ancient stone structures called Taulas that date back to 2300 BC. Some of these spot are surrounded by private property and hard to get to. Your driver will get you to those hard to reach places, that secluded spot on the beach for a swim and that perfect spot for a gourmet picnic with a view. A visit to Menorca is not complete without cocktails at sunset on one of the terraces beds at Covas den Xoroi. It is ancient love nest turned sunset/night club in Cala den Porter just a couple miles from Hotel Torralbenc. The dance floor is set in the caves with the bar and terraces jutting out the cliffside hanging all about 30 meters above the sea. It is one of the most spectacular settings for cocktails and dancing in the entire Mediterranean. For the best seat in the house reserve a private terrace with bed to watch the sunset in style. Later, around midnight you can return to dance in the caves until the sun comes back up!